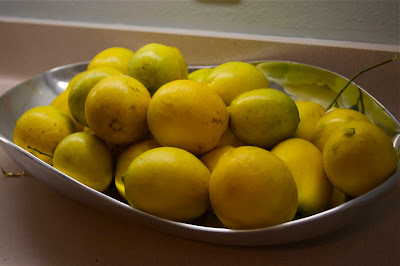 I just picked all these lemons off the lemon tree in our backyard. And there's about 100 more still hanging on the tree! If any of you have any favorite lemon recipes, pass them on. Pies, cakes, savory stuff, anything you can use a fresh lemon for - I will not discriminate much against any recipes at this point. I have a feeling I will be making lots of lemon treats in the coming years! You could also make homemade cleaning supplies with the lemons!